Anchoring the southern end of Sleeping Bear Dunes National Lakeshore in Benzie County is Old Indian Trail. The path picks up its name from when Native Americans used the route to access their fish camps along Lake Michigan and today draws less attention than any other trail in the park. Many visitors and hikers bypass this area of Sleeping Bear Dunes for the dramatic scenery found at places like Empire Bluffs or Pyramid Point. But the trail still provides access to a beautiful beach and is often a rare escape from the summer crowds encountered elsewhere in this popular park. Old Indian also has one of the most unusual warnings found at any trailhead in Michigan: You Are A Visitor In Cougar Habitat. It was along this trail that several cougar sightings were reported and resulted in the NPS posting the unusual trail sign here and elsewhere in the park. The trailhead sign goes on to say that seeing a cougar can be a thrilling experience but that if you do encounter one remain calm and do not run. If approached wave your arms and throw sticks and rocks. If attacked, fight back aggressively. What a way to spice up a hike. Old Indian Trail is a pair of loops that merge at 0.25 mile from the shoreline. Following the perimeter of the loops out to the beach and back would be a 3-mile, one to two-hour trek. Overall Old Indian is an easy walk along a wide path. Black Arrow Loop is by far the more interesting of the two as it dips and climbs a series of old beach dunes now forested. This described hike below follows the Black Arrow Loop. The trail is also a popular area for Nordic skiers in the winter. The Green Arrow Loop is rated easy for beginners and is relatively flat with only a couple of gentle slopes. Black Arrow is rated intermediate and has one steep downhill section in the northeast corner of the loop. From a the trailhead the foot path enters a mix of hemlocks, maples and oaks and for most of the hike remains in the forest, keeping you cool even on the hottest summer day. You quickly pass the posted junction with the return of Green Arrow Loop from the west (left). Continue north and the next junction is reached in 0.3 mile. Continue north at this junction to follow the Black Arrow Loop. This route is by far the most interesting and is hilly enough to be marked by black triangles indicating an "Advanced" trail for skiers. For the next mile, you hike over a series of low dunes, forested in mixed hardwoods (maple, beech, oak) and pines. You remain in the woods except when the trail descends to a marsh or pond. At Mile 1.2, you pass a spot where open dunes are migrating south into the forest, sand pouring down between the trees. From here it's 0.3 mile to the posted junction where you head north (right) for the beach. 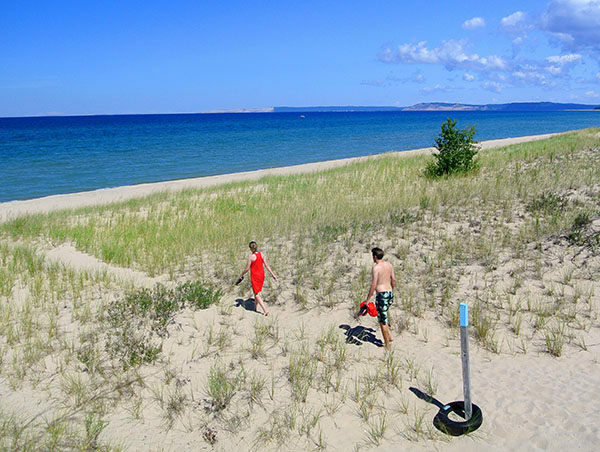 From the junction you immediately climb a dune, the steepest of the hike, and from the top enjoy a sweeping view of Lake Michigan. 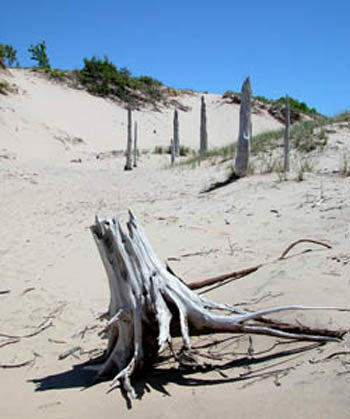 Blue tipped posts then lead you past a ghost forest and through open dunes before ending at the shoreline, a quarter mile from the junction. This is a scenic spot, even though a couple of cottages are visible to the west. To the east you view nothing but the wide expanse of low beach dunes along Platte Bay, while off in the distance is the famous Sleeping Bear Dune. 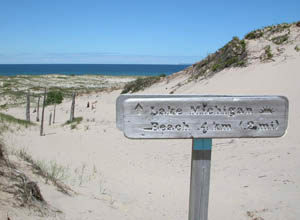 Out in Lake Michigan, you can see North and South Manitou islands and South Manitou's perched dunes along its west side are clearly visible. The beach is usually 20 to 30 feet wide, depending on the lake level, and you can walk it the length of Platte Bay. To return, backtrack a quarter mile to the beach junction and this time head southeast along the Green Arrow Loop. The level route quickly passes a junction to the "middle" trail and in 0.3 miles Green "Easy" triangles mark the return route east (left), while another unmarked trail continues its course south. This final leg is 0.75-mile long and relatively flat. It traverses ancient beach dunes that mark the former location of the Lake Michigan shoreline, when the water level was considerably higher in the early postglacial era. At one point, you pass through an impressive stand of beech, with one huge tree right next to the trail. Eventually you arrive at the first junction you passed from the trailhead. Head south (right), and you'll be back at the parking lot in minutes. Within the parking area is a display sign and map box along with a vault toilet but camping is not allowed here, along the trail or on the beach. From the Philip Hart Visitor Center in Empire, head south on M-22 for 12 miles and look for the entrance to the trailhead parking lot, which is posted on the north (right) side of the road. If heading north from Frankfort, follow M-22 and look for the posted entrance just beyond Sutter Road.